4:44 p.m., Nov. 3, 2008----Thomas H. Epps III, University of Delaware assistant professor of chemical engineering, and Erik Thostenson, assistant professor of mechanical engineering, are among just 39 scientists and engineers throughout the country selected to receive three-year research grants from the U.S. Air Force Office of Scientific Research (AFOSR) Young Investigator Research Program. The 39 awards total $12.1 million. YIP is aimed at fostering creative basic research in science and engineering and enhancing early career development of outstanding young investigators. Areas of interest include aerospace, chemical and material sciences; physics and electronics; and mathematics, information and life sciences. The University of Delaware was one of just six universities to receive two of the awards. Other winners represent such well-recognized institutions as Johns Hopkins, MIT, UCLA, Brown, Princeton, Notre Dame, Virginia Tech, Michigan State, the University of Wisconsin and the University of Illinois. 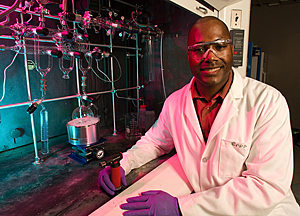 Epps's research will focus on materials design and fabrication to create conducting membranes for current and next-generation energy generation and storage devices, such as batteries, fuel cells and solar cells. The work will produce new nano-structured soft-material networks for ion-conducting membranes, where these self-assembling networks will overcome many of the limitations found in current membranes, including poor mechanical integrity, poor temperature stability, non-uniform pore sizes and poor chemical compatibility. 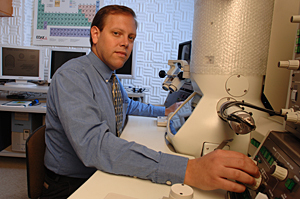 Thostenson will study novel micro- and nano-structured composites for sensing and actuation. “The emergence of nanotechnology has enabled new material systems where structural and functional properties can be tailored,” Thostenson said, noting that he plans to develop novel composite sensors and actuators with enhanced functional properties by tailoring the actuator structure at the micro and nano scales.